After a lengthy voyage across the Alpha Ocean and a brief stopover at Beta Bay, World of Warships has at last arrived into port, hulls gleaming and cannons primed for the final version. It's strange to think the game was announced four years ago, at the same time as the disappointing World of Warplanes, and well before the excellent mobile version of World of Tanks. A vast amount of time and effort has clearly gone into this mighty vessel of a game. But was it worth the wait, or should the project have been scuttled long before now? The answer to that question is 'it depends'. 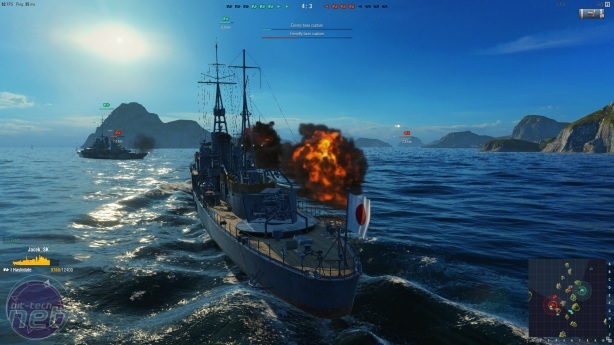 World of Warships' slower, more methodical approach to multiplayer shooting makes for an interesting tactical challenge, and there are moments when it explodes into gloriously exciting games of aquatic cat and mouse. Yet it also requires considerably more patience than pretty much every other multiplayer shooter out there, both on the smaller scale of individual deathmatches, and on the larger scale of its expansive but rather grind-happy free-to-play model. What World of Warships certainly has going for it is immediacy. Like the other "World of" games, the time between launching the game and embarking upon your first battle is a matter of minutes. 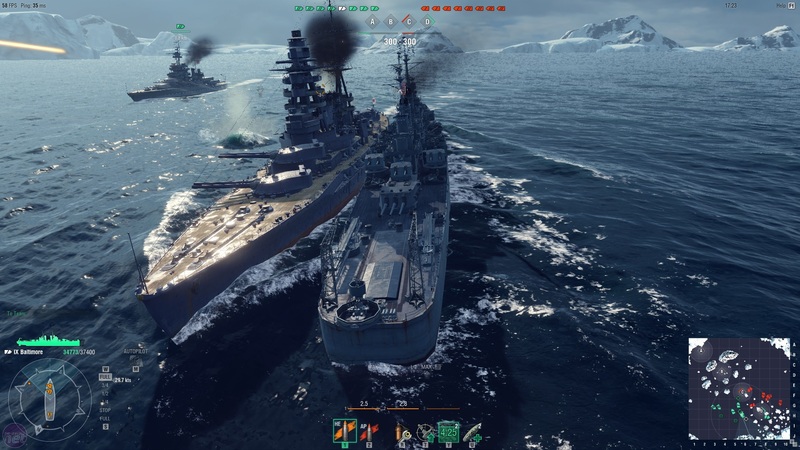 You jump in, select a ship, click "Battle!" and within 90 seconds your chunk of floating grey metal bobs happily in a square of royal-blue ocean, waves lapping gently at its hull. From here you must win the match in one of several ways; capture the enemy base (which rarely happens), hold a series of control points (which also rarely happens), or destroy all the enemy ships (which nearly always happens, because blowing stuff up is 1000x more fun than sitting around waiting for a bar to fill). The ships themselves control with simplicity and elegance. WASD controls acceleration and steering, while the mouse is used for aiming, zooming and firing. 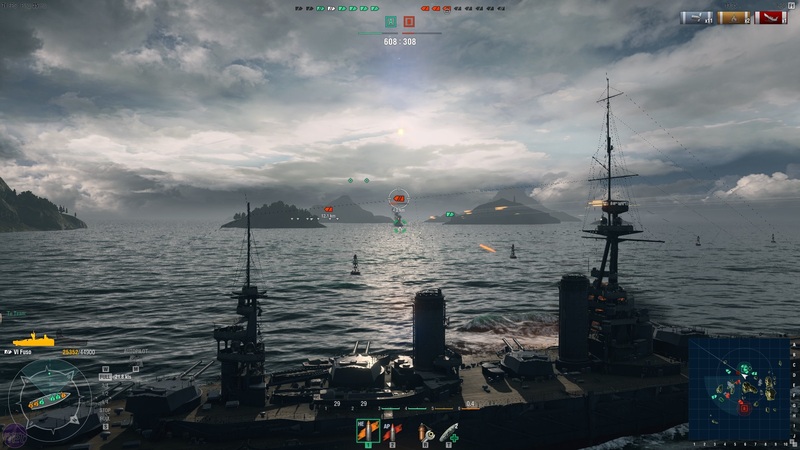 Cleverly, the zoom ability also denotes the range of your guns, so if you can't sight a ship in your sights at maximum zoom, you know instantly that your shells will fall short. Aside from this, the only other controls you need to know are for ammo types' special abilities, all of which are depicted at the bottom of the screen. The exception to this setup is the aircraft carrier, which handles in a different way that we'll discuss later. 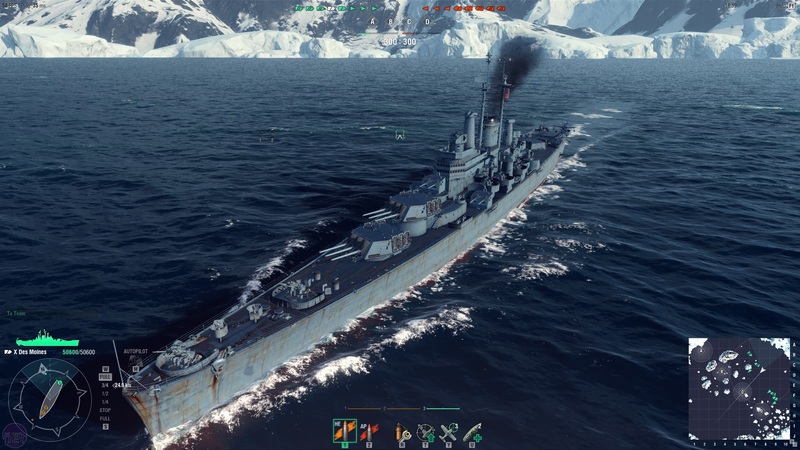 It's interesting reviewing World of Warships after the superb Prison Architect. Like Introversion's management sim, Warships also plays with the notion of a delay between action and resolution, albeit in a slightly different manner. Almost every action you perform in game, from accelerating to turning to firing, can take anywhere between 5 and 30 seconds to complete. Success in World of Warships involves mastering how to compensate for these delays. When firing at an enemy ship, you need to adjust your aim to take into account its speed and direction, else you'll miss the target. And if you see flak headed your way, you need to start turning immediately to throw off your opponent's aim. Rick went to Wargaming Fest in Russia and came back with a few stories to tell. Bundle includes all original games, too.